"Simplicity, simplicity, simplicity!" Thoreau Escape to the beauty of the Blue Ridge Mountains and the sounds of the Shenandoah River. 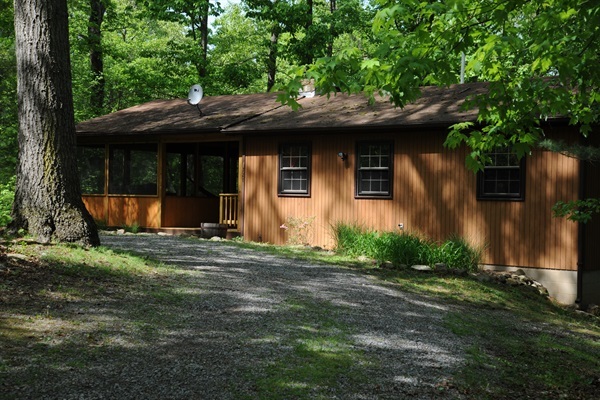 Located just 75 minutes from the Capital Beltway, and nestled on six wooded acres in the heart of the Shenandoah Valley, The Cabin is the perfect getaway for couples, families or a small group of friends (2-4 people). The Cabin offers two bedrooms, both with Queen beds. Rustic knotty pine walls and a large stone fireplace enhance the dining and living area. (Gas Logs in Fireplace) The kitchen is fully equipped and is a step away from either an 8' x 14' outdoor deck or your own spacious 20' x 20' screened porch. On the screened porch you will find a four person Jacuzzi hot tub, a picnic table for outdoor dining and a hammock where you can lie back, relax and listen to the Shenandoah River. For those who want the camping feeling there is an outdoor fire-pit. Our private river access is less than a mile walk from the cabin. We are also within a half an hour of many popular attractions such as canoeing or tubing on the historic Shenandoah River, hiking in the Shenandoah National Park, horseback riding, or fly-fishing on a mountain stream. You can take a drive along Skyline Drive or explore the depths of Luray Caverns, or just browse for antiques in downtown Luray. For children there is Jellystone Park with miniature golf and the Luray Reptile Center and Petting Zoo. Massanutten Ski Resort is only 45 minutes away. The Cabin is a great base for year round activities in the mountains of Virginia. Come enjoy the privacy of your very own cabin in the woods.